A sum of R10,000.00 ($1,000 USD for international students) is required in order to activate your account. A minimum of R5,000.00 ($700 USD for international students) is required in your account at all times. Accounts that are 30 days and older interest will be charged at Standard bank’s ruling prime overdraft bank rate. All flying times are calculated from the Aircraft Hobbs meter. If the Aircraft is not equipped with a Hobbs meter, the TACH time should be used for billing and logging after being multiplied by 1,2. If you do not cancel your lesson more than 24 hours in advance, you will be liable for a school fee of R250. If you are more than 20 minutes late, the flight will be cancelled and you will be liable for a school fee of R250. Under no circumstances will any pilots be allowed to fly without the appropriate excess insurance cover. It is the pilot’s responsibility to arrange cover and keep it up to date. Market related interest will be raised on any unpaid account exceeding 30 days. Bookings must be made in consultation with your instructor at least 1 day in advance. Please phone the school and confirm your booking and times the day before. Hire and fly bookings can only be made at reception. When booking aircraft for extended periods (24 hours or more) a minimum charge of two hours per day will be made. Some aircraft may not be available for extended hire. No bookings are to be made with instructors who are not employees of Durban Aviation Centre without the approval of the CFI or Operations Manager. Both students and flight instructors are to do their best to arrive 15 minutes before training flights. If a student is more than 15 minutes late, the school reserves the right to cancel the lesson and the student will be charged a no show fee. The No Show Fee rule will not be applied in case of unforeseen circumstances, such as illness and unsuitable weather conditions This is to be at the discretion of the Flight School. If students are to go on leave, the training instructor and Operations Manager must be notified of the date, duration of leave and date back at training. During all solo flying you must carry your licence with you and comply with the regulations as set out by the South African Civil Aviation Regulations. Your logbook must be kept at the training school while you are undergoing training. The logbook shall be filled in after each flight in black ink. The authorization sheet must be filled in before and after every flight. This includes filling in the amount of landings completed, excluding one full stop landing. The flight folio must be filled in after every flight and the correct start and stop Hobbs written down. All fuel uplift and oil must be noted and the licence number and name of the pilot filled in. When starting a new page fill in the required details at the head of the page. Student files must be filled in after each flight and signed by both the student and the instructor. The student must also fill in solo flights. Student files are never to be removed from the school. In the event that an aircraft becomes unserviceable at an away aerodrome then the pilot is to stay with the aircraft until an AMO has inspected or repaired the aircraft. The operator will be responsible for accommodation for the pilot at a place agreed upon by both partiesDURBAN AVIATION CENTRE HAS A ZERO-TOLERANCE TO STUDENTS FLYING WITHOUT ALL AIRCRAFT DOCUMENTS BEING IN ORDER! Once cleared by your instructor for solo re-fuelling and pre-flight inspections, please plan to be at the school at least 15 minutes prior to your booking to prepare the aircraft. Please also refuel any aircraft after a flight of 2 HRS or more, or after the second flight from full. Only East Coast (Shell) will be used for refuelling the aircraft. Students must check the TACH time before every flight. Never go over the MPI time! All students and private pilots must fill in a flight plan before leaving on a navigation flight. Please leave a copy of your flight plan in the designated tray in the lecture room. It is always the responsibility of the Student to, when flying on cross-countries, settle the landing fees on site at all airports other than Virginia. Touch-and-go’s at Virginia will be charged onto the Student’s account; fees for one full stop landing is included per flight/booking. If you plan any night flying, or early morning flying, whether dual or solo, it is your responsibility to ensure that, before 4:30 pm, that the aircraft is refuelled and left out of the hangar. If any snags were found on the aircraft, notify an instructor before taking the aircraft to maintenance and do not snag the problem in the aircraft flight folio. The instructor will do so if needed. Please bring your own fuel strainer and soft cloth for the windshield for every flight. Please supply your own torch and stop watch for night flying and instrument flying. Ensure that the key is out of the magneto switch. Control locks must be in. Pitot tube covers must be put on. Window covers must be in place. Aircraft are to be parked at the correct hangar. If aircraft is parked outside, make sure it is parked behind the white line, ensuring sufficient clearing distance from the taxiway. Fill in the authorisation sheet as required. Report aircraft snags to Durban Aviation Centre Staff. Settle all landing fees, when landing at another field than Virginia. Aircraft must be left clean . All students will be issued with a personal checklist and expected to know it well before solo flight. All airborne and emergency checks are to be committed to memory. Never fly without a type specific checklist. No student pilot may practice spins and a private pilot may only practice spins if he has done spin training in the last 14 days. Spins shall be done at a height of more than 3000 feet AGL. At no time may SOLO LOW FLYING be conducted. No students will be allowed to fly after excessive drinking the night before, nor will pilots be allowed to take passengers who are under the influence of alcohol. Should a student fail to reach the required standard to be sent for their first solo and or to pass their PPL, Durban Aviation Centre reserves the right to terminate their flight training without further notice. No Student Pilot may fly solo without a dual check if more than five days have passed since their last flight. 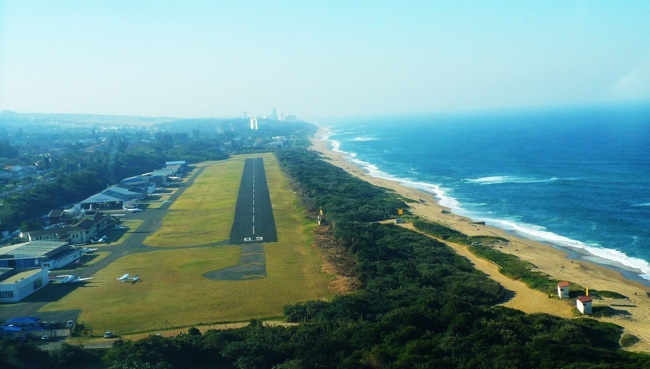 No licensed pilot may fly any Durban Aviation Centre Aircraft if they have not flown an aircraft in the same category within the last six calendar weeks. Dual checks will entail at least three circuits and any other training at the discretion of the Instructor. With regards to complex aircraft, if you haven’t flown it in the last three calendar weeks, you would need to do a briefing in the aircraft with an instructor. If you have not flown it in five calendar weeks, you would have to do a dual check in the aircraft you are going to fly. Coffee and tea is available in the reception while you wait or just to come in for a chat. Smoking is not allowed in front of the terminal building. During briefing or flight training, please ensure that your cell phone is off. The reception/lecture room must be kept tidy at all times. Avoid leaving bags, cups, papers etc. lying around. Students are to take notes during lectures and briefings. These notes must be kept in a properly organised file or a notebook. Students are responsible for having a black ball point pen with them at all times – this to complete flight folios, authorization sheets etc. All full time students must wear the Durban Aviation Centre uniform as prescribed. This will be a navy/black pant with the white pilot shirt, black belt and black shoes. Bars shall also be worn in accordance with the licence held: blank epaulets for an SPL, one bar for an SPL with First Solo Flight, 2 bars for a PPL and 3 bars for a CPL. All other students are to dress appropriately. Suitable footwear must be worn; students may not fly wearing Slops, high heeled shoes or shoes with excessively thick soles. Those students and/or pilots that contravene these rules will be issued with a written Notification of a Red Tag and a red tag will be attached next to their name on the student board. In the event that three red tags are issued then an official warning letter will be given to the student. There after, any infringements of the club rules will result in the issue of further warning letters. Any student who receives three warning letters may be expelled from the school without further notice. Red Tag and warning letters will be given to the student in the presence of the CFI in order to give the student opportunity to respond. All school material, irrespective of whether marked as such, is copy righted. Do not share notes, tests or any other forms or documents with anyone outside of Durban Aviation Centre. Please refrain from posting information about Durban Aviation Centre, in any form and on all types of media, which may be of a derogatory nature. Thank you for taking the time to familiarise yourself with the rules!